Sometimes it may become necessary to have your blood pressure monitored for a period of time or you may just want to keep track of it for your piece of mind. 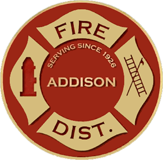 The Addison Fire Protection District provides blood pressure checks free of charge between the weekday hours of 1pm and 4pm at our headquarters fire station located at 10 South Addison Road. We recommend you call 630-628-3100 prior to coming to make sure our paramedics are in the fire station. The importance of monitoring your blood pressure. Some experts call it the silent killer. High blood pressure (hypertension) most often has no symptoms, so a significant number of people who have high blood pressure might not realize it. Untreated high blood pressure can damage organs over time and lead to stroke or heart disease. Because blood pressure changes constantly depending on what we are doing, experts recommend people at risk or people who already have high blood pressure closely monitor it on a regular basis. More information about blood pressure can be found on the American Heart Association’s website.